Israeli authorities organized a special covert operation to smuggle a 600-800 years-old Sefer Torah from Yemen along with 17 Israelite Yemenis. Israel’s concern about getting this copy of the Torah exceeded their worries about the consequences and conditions the remaining 3000-strong community of Israelite who are unwilling to leave Yemen for Israel. Also, Israel didn’t care about national and international laws regulating the acquisition of such historic artifacts. So, why Israel is so concern about getting this copy to the extent it acts openly unlawfully and recklessly in a criminal manner? Could any country in the world do such things and be allowed to escape the legal and political consequences? Would the international community still regards Israel as a trustworthy and legitimate entity or acting as a decent state? Do igniting civil wars, kidnapping, archaeological looting, artifacts effacing, statue battering, and conducting compulsory family planning are among the tools used by Israeli authorities to maintain and protect their official version of history? [When almost 20 Yemeni Jews fled the town of Raydah in a covert operation, few people thought of the handful of members of the 3,000 year-old Jewish community who had been left behind in the nearby city of Sana’a. As the figurehead of the exodus, Rabbi Saliman Dahari – who brought an 800-year-old Torah with him to Israel – posed for pictures with Benjamin Netanyahu last month, he was not to know that the widely-circulated image would have serious consequences for the Sana’a Jews. Yemeni authorities were incensed by images of the Israeli prime minister holding what they considered to be an artefact belonging to their country. 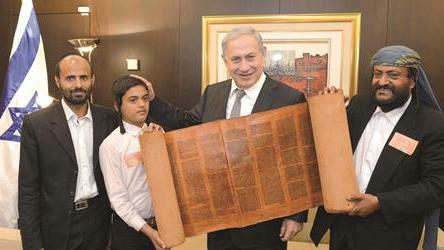 To their mind the Sefer Torah had been illegally smuggled out of Yemen. The JC can reveal that the consequences of the image being seen around the world were catastrophic. Israel’s Immigration and Absorption Minister Ze’ev Elkin said the media reports endangered lives of those who remained in the country. Just days after media outlets told the story of the rescue of the 17 Yemeni Jews, armed forces closed in on the remaining members of the community living in the city riddled with civil unrest and controlled by Houthi rebels. Soldiers banged on the door of an Orthodox teacher in his 30s. They arrested him on suspicion of helping “smuggle” the Torah scroll out of Yemen. A second Jewish civilian, who made aliyah 10 years ago but later returned to Yemen, was arrested for being a “Mossad Zionist spy” last week. On Wednesday, his mother was also taken into custody. A Muslim airport worker was also arrested for allegedly failing to seize Rabbi Dahari’s bag at checkout. Israeli American Moti Kahana, founder of NGO Amaliah, who famously helped rescue the last Jews of Aleppo in Syria last year, is one many activists said to be negotiating with Houthi representatives to free all four detainees, who are believed to have been tortured. On Wednesday, Mr Kahana said he hoped they would be home in time for tonight’s Seder. He said: “We are talking to the Yemenis. We have put two offers on the table to get them out of jail. We hope they will be home for Pesach. Mr Kahana said he wants his New York-based organisation, which cares for hundreds of Jewish artefacts from Syria, to hold the Torah. He said: “When I saw the scroll in the media I knew the Yemeni government would complain, they would say that international law was broken. “We would bring the Torah to New York for safe-keeping until Yemen is safe. One day, when the war is over and Jews return to the country, the Torah can go back to Yemen. Yes, Yemen is in chaos and ruins now, but no state or organization must allow such rouge transgression to happen without serious challenges for them. This is not the first precedent nor will it be the last if actions are not taken. Respect yourself by respecting others. Yes , the Jews will do whatever it takes to maintain their official version of history. That is why we need historical revisionists to bring history into accord with the facts. The Jews smear such revisionists as being “anti-Semitic”. “Anti-Semitic” because revealing the Turkic Mongolian Antisemitism! What a silly myth and slumber infecting the world. Thanks, it needs a lot of analysis and investigation to verify it.